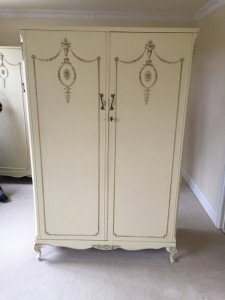 A matching pair of shabby chic style double wardrobes, hand painted in cream with gilt detailing. 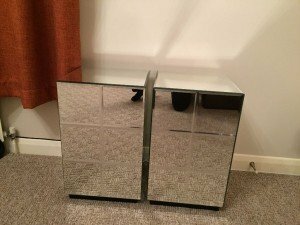 A matching pair of contemporary style square mirrored bedside cabinets, each with one shelf inside. 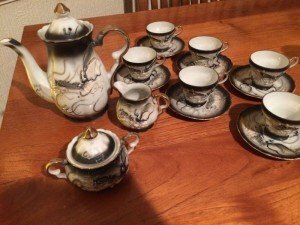 A small grey and white Oriental tea service, comprising of a large teapot, a lidded sugar bowl, a milk jug, six teacups and six saucers. 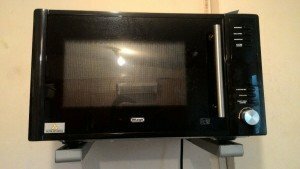 A black and stainless steel DeLonghi combination microwave oven. 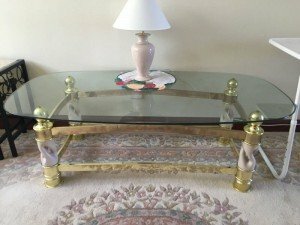 A vintage brass and marble coffee table with an oval glass table top, together with a pink ceramic table lamp. 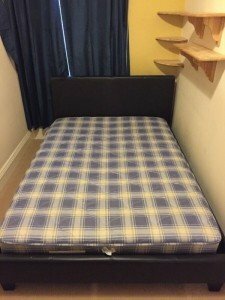 A black faux leather raised double bed, together with a bounce back double mattress. 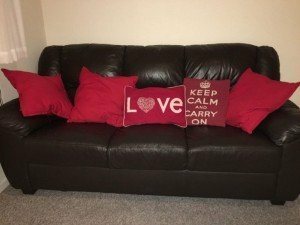 A three seater high back sofa, upholstered in chocolate brown faux leather, together with five various red sofa cushions. 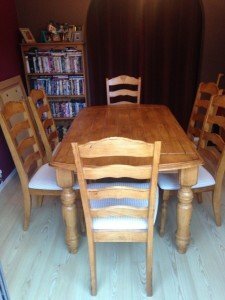 A pine farmhouse style dining table, together with six matching high back dining chairs and six removable chair cushions. 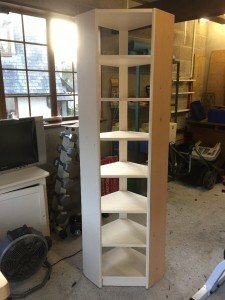 A solid wood panelled corner shelving unit, having seven deep shelves. 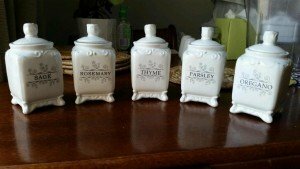 A collection of five vintage ceramic white spice jars, each with the name of the spice it holds. 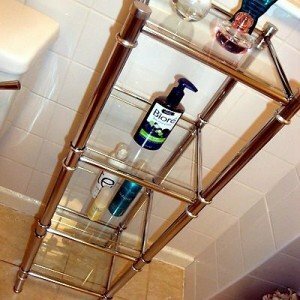 A large chrome bathroom shelving unit, having four slide out glass shelves. 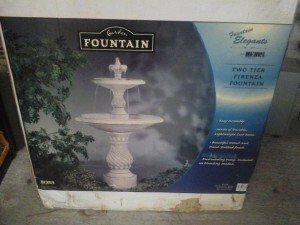 A brand new and in the box, two tier ceramic Firenza outdoor water fountain. 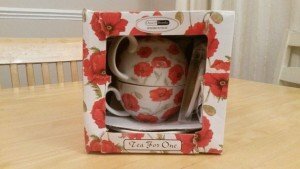 A brand new in the box tea for one gift set, comprising a tea put, a teacup and a saucers, decorated with a poppy design. 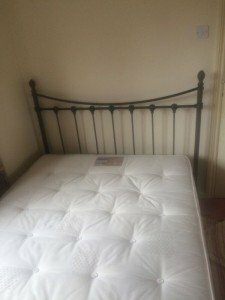 A grey metal double bed frame, together with a memory foam silent nights double mattress. 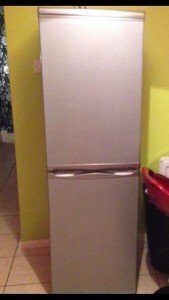 A tall standing Hotpoint two in one silver fridge freezer, the freezer with inner drawers. 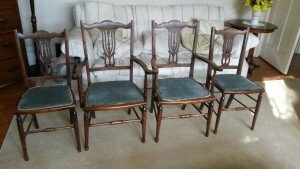 A set of four Edwardian style mahogany dining chairs, all with open backs and upholstered in dark green leather. 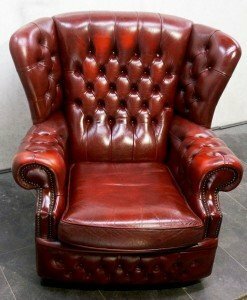 A vintage Chesterfield high back gentleman’s club chair, upholstered in ox blood red authentic leather. 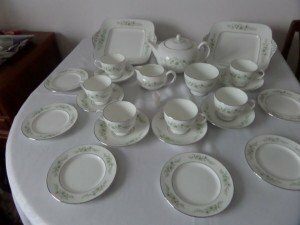 A large floral patterned Wedgewood tea service, comprising of a teapot, teacups and saucers, dishes etc. 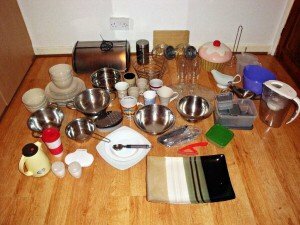 A large collection of kitchen accessories, to include a bread bin, a dinner set, mixing bowls, cookie jars, mugs, glasses, a fruit bowl etc. 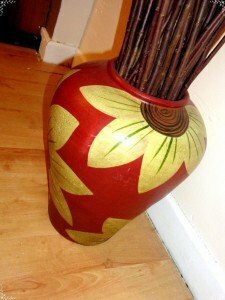 A large ceramic floor vase, hand painted in red with a yellow and green floral design.